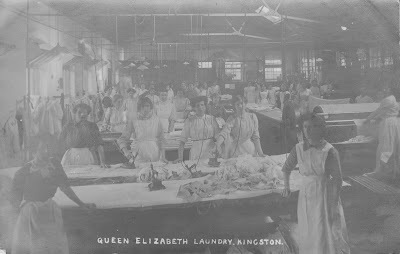 I have three pictures of this laundry - getting hidden in the mists of time. This is the most interesting because it shows faces from the past - if you expand it. I count 38 women, and in the background one man - possibly the boss or the cleaner. The ladies all look towards the camera except one. They are pausing for a photograph - a nice change from all-day ironing!! !